Every week the congregations are asked to give their best offering in faith, to their individual churches, to God. Yet where is their example? The example should be a demonstration from the church leader to bless unconditionally the other churches in their locality, regardless, and looking for nothing in return. This is the true and required example, which is showing no more faith than is being asked of the congregations. it is clear to them that this is our hideous, and obvious failing. and hiding it from us? yet we know this couldn't be farther from the truth. we have to bless the churches around us. anything less is weakness, and brings shame on God's people. We can trust that the Holy Spirit will correct those who's doctrine we believe is wrong, but this wont happen until we are washing their feet just like our Lord Jesus showed us. 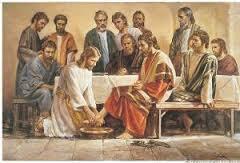 It has proved so much easier for us to correct our brother, rather then to serve and wash his feet. whilst we are blessing the other churches around us. that our God will not let us down with this. He hurts to see His Bride in discord.